The property comprises 15 levels of commercial offices over 5 levels of security carparking which was constructed in 1966. Recently the buildings air conditioning was replaced and further services upgrades are in the process of been carried out. The building rviced by 6 lifts with direct access to the parking located beneath the building. The building has sweeping views of Darling Harbour and the City with direct access to the Harbour Bridge and Western Distributor. 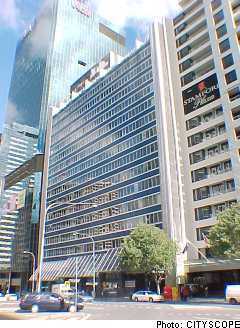 189 Kent Street is situated on the westernside of Kent Street close to the Sydney Harbour Bridge whilst only a relatively short stroll to the centre of the Citys Financial and Business District. Deceptively convenient, 189 Kent Street is the same distance (3 minutes walk) from Wynyard Rail Station as the GPO, while Grosvenor Place,Circular Quay and George Street are also a short easy stroll. Unique space with floor to ceiling glass windows, amazing city views and great natural light. Layout consists of reception, 2 offices, 2 seperate open plan areas, kitchenette, store/comms room and own bathroom.